The stylish NuTone Hampton Series medicine cabinets fit in standard wall openings for medicine cabinets (14 1/4 inches wide by 24 inches high by three and one-half inches deep). Product features include a framed exterior mirror, a durable piano hinge, adjustable glass shelves, an innovative soft-close magnet, and a rust-resistant white steel body. They are available with right or left hand openings. According to Patrick Nielsen, Senior Product Manager for NuTone, "The Hampton Series provides homeowners and builders with attractive storage solutions while eliminating the need to match the grain, stain or gloss of wood cabinets." to their bathroom fixtures. Unlike a standard wall mirror, medicine cabinets provide homeowners with extra storage, something that is always appreciated. 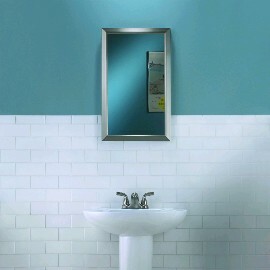 For more information about the Hampton Series Medicine Cabinets, see www.nutone.com.